As a meeting professional, you have many choices of destinations to choose from in the Southwest. But have you ever considered Tempe, Arizona? Combine a prime location less than 10 minutes from Phoenix Sky Harbor International Airport, near-perfect weather, a thriving local dining scene, and flexible meeting locations, and you have a perfect place for your next meeting. 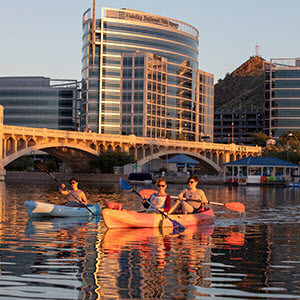 Tempe is a great choice for meetings for 10 to 500 attendees, and the Tempe Tourism office is offering the “Choose Tempe and save $500” promotion in 2019. Top meetings properties include the hilltop Phoenix Marriott Resort Tempe at The Buttes, featuring 353 guest rooms and 40,000 square feet of indoor and outdoor meeting space. Nearby, the DoubleTree by Hilton Hotel Phoenix Tempe offers a beautifully landscaped, resort-style property with 272 guest rooms and more than 25,000 square feet of meeting space. Downtown Tempe has a number of hotels, including the Residence Inn by Marriott Tempe Downtown/University, AC Hotel by Marriott Phoenix Tempe Downtown, and the Courtyard by Marriott Tempe Downtown. The largest hotel in downtown Tempe is the 303-room Tempe Mission Palms hotel, which offers more than 30,000 square feet of indoor and outdoor function space. Before and after the meeting, your attendees will enjoy the pedestrian-friendly downtown Tempe area, which offers more than 60 restaurants, pubs, and night spots. Breweries and locally owned, chef-inspired dining experiences can be found throughout Tempe. The city also offers Broadway shows at ASU Gammage, contemporary art at ASU Art Museum, kayaking and paddleboarding on Tempe Town Lake, miles of hiking trails in Papago Park, and the beautiful Desert Botanical Garden, all within minutes of any hotel in the city. Are you ready to research and experience Tempe for yourself? Get started by selecting the Claim Promotion option on Cvent’s promotions page. To qualify for the “Choose Tempe and Save $500” promotion, meeting planners must submit their RFP and book their business at a Tempe property. The planner can receive up to $500 off their master bill when they book a minimum of 100 room nights and spend $5,000 in food and beverage. You can also contact our staff and learn more about our Destination Experience program, which provides a personalized itinerary for planners to explore Tempe. Contact our team at 800-283-6734 or visit us at TempeMeetings.com.